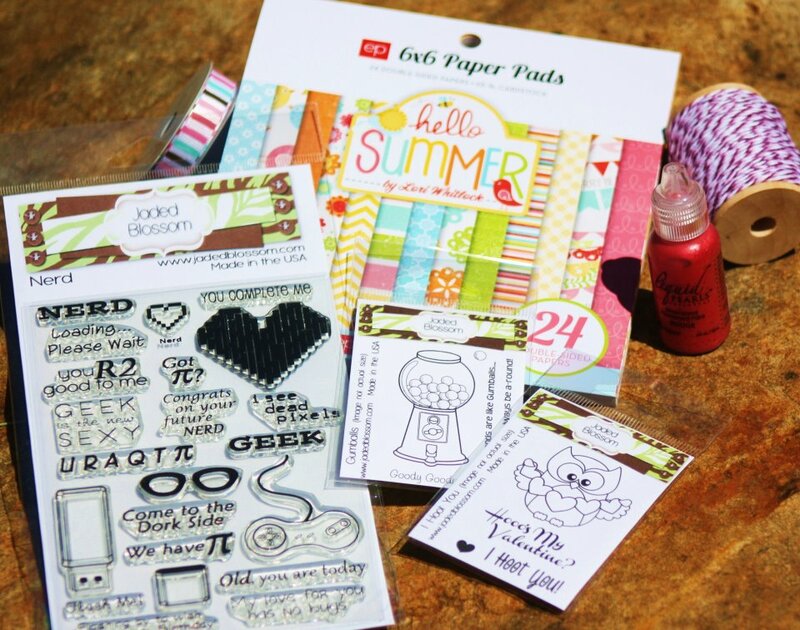 Jaded Blossom: June Stamp Release details & Sweet Giveaway winner! June Stamp Release details & Sweet Giveaway winner! Didn't win the giveaway? No worries, here is another chance!! Any orders placed during the month of June will be entered into another giveaway for the same prize pack we gave away for Michelle's birthday! Here is the picture again in case you forgot what was included. We are soooo excited about our upcoming stamp release! We are going to do things a little differently this month. Each day starting Monday, June 4th we will reveal a stamp set coming out on Friday the 8th and projects that the design team created with that stamp set! So make sure to check back every day next week to see all the sneaks! ALSO, make sure to check back on Sunday the 3rd because a new challenge will be posted. And with a new challenge comes a new guest designer!!! This month Zeni will be guest designing with us! So to recap... Sunday - Challenge!Monday - Thursday - Stamp reveals & projectsFriday - Blog Hop and official stamp release at 8 am! Can't wait to see the new stamps you have in store for us. Congrats to winner!cant wait to see the release. Congrats Tracy and Congrats Zeni! Congrats Tracy!!!! Congrats Zeni...can't wait to see all your great work!!! Stefani. www.stylesbystefani.com. How do I put an order in? How do I get an url number?